Hoodies are great specially if they have something on it you really like. This Doctor Who hoodie for women is one of those. On the back of this hoodie you can see the Tardis from the Doctor and it seem to be flying through the galaxy. The whole back panel of this zip up hoodie is covered in this Tardis picture and besides that the hoodie is just Tardis blue. You can get this Doctor Who hoodie in women’s sizes Small – 2XL and it has a slim fit. And this Tardis hoodie is made from 100% preshrunk cotton to be just perfect for about everyday of the year. 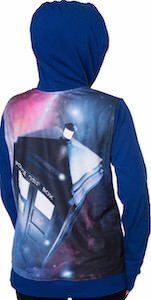 Doctor Who fans come check out this Doctor Who Tardis In Space Hoodie.